Illusion and the Way. The Truth is One for Everyone. Release 2 ! In this program, issues of human self-perfection on the way to God are discussed. Why does a person spend a lot of time only thinking he or she is engaged in self-improvement, but is not moving along the way in actual life. How does consciousness deceive Personality in the fight for attention? What substitutions are imposed by consciousness? A figurative example of the theatre of shadows with actors and a viewer. Why is a period of one year necessary for a person to get rid of his or her images (demons) that bring suffering? What is the contact like with the Spiritual World? How can one achieve integrity and reconciliation within oneself, and reconciliation with God? What does responsibility and service mean? 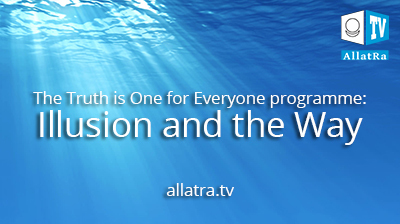 These and many other topics are addressed in The Truth is One for Everybody program.